This process requires an existing GitHub Enterprise account. We recommend using the Auto-connect integration panel to connect multiple repositories from your GitHub Enterprise account. On your Jira Server dashboard menu, go to Git > Manage repositories. On the Auto-connect integration panel, click GitHub Enterprise. The Connect wizard is displayed. 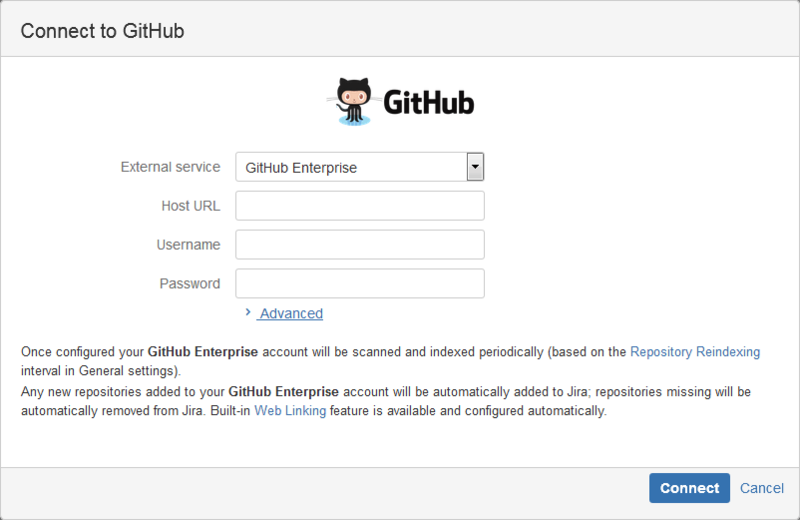 For the Host URL, enter the address of the GitHub Enterprise server. Enter the login credentials as required. For repository managers, collaborators or users that have enabled 2FA, enter username and the personal access token (PAT) as the password. For more information on setting up PATs, see Connecting to a GitHub Account with Enabled 2FA. This is a filter based on text in the repository name. It will list repositories with names containing "git". Do note that the declared string format is case-sensitive. On the following screen, Git Integration for Jira app will read all available repositories from your GitHub Enterprise account. Click Import repositories. Repositories that are added or removed from GitHub Enterprise will be likewise connected or disconnected from Jira Server. After the import process, the Settings dialog is displayed. This process requires an existing GitHub Enterprise git repository. Look for the the GitHub Enterprise git URL on the repository project page. Use this information to connect the GitHub Enterprise git repository to your Jira server via Git Integration for Jira app - dashboard Git menu > Manage repositories > Connect to Git Repositories. If two-factor authentication is enabled for your GitHub account, you will need to create a PAT to access your git repositories. Follow the steps outlined in Connecting to a GitHub Account with Enabled 2FA. We recommend using a "service user" in GitHub (example: "GitIntegrationforJira") to be used to integrate GitHub with the Git Integration for Jira add-on. This dedicated "service user" will allow the GitHub administrator to set permissions so the add-on clones only the desired repositories. Assign GitHub permissions for team members or collaborators to allow which resources are accessible for service users. This feature is only available in a GitHub Organization. Login to your GitHub Enterprise account. Under Organization settings, click Member Privileges. Choose the default permission level for organization members. The default repository permission only applies to organization members and not to outside collaborators. 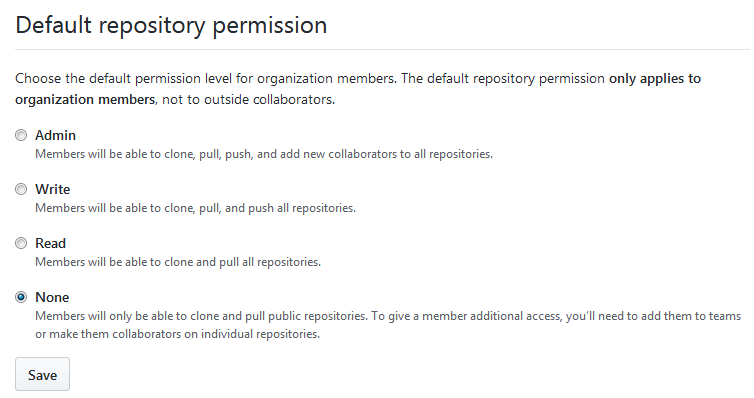 If the default permission is set to None, organization members will need to be given access to repositories using the Teams or Collaborators methods (see below). For more information, see Access Permissions on GitHub. 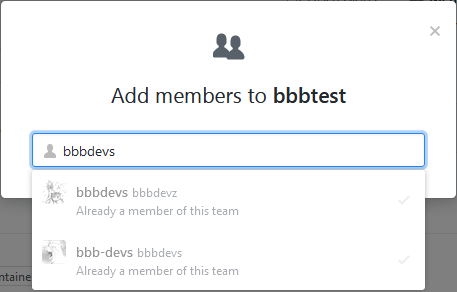 To give a member additional access, they must be added to a team or make them collaborators on individual repos. Set Read, Write or Admin repository access as desired. Create a team in your GitHub Organization. Invite a member to add it into the team. An email invitation is sent to that GitHub service user. The service user is then added to the team if the invitation has been accepted. Set desired Role for this member. Convert this member to outside collaborator. Give this member access to organization repositories. Remove this member from the team. Click Manage access to manage repository access for this member. While users have configured PAT for repository access, users in a GitHub Enterprise must at least have Read permissions. This allows them to view commits and smart commits, and browse repositories (if enabled) of connected GitHub Enterprise repositories inside Jira. For repository managers, collaborators and commit authors, set these users to have Write permissions. This will allow them to view commits and smart commits, browse repositories and also enables them to create branches and pull requests to specified GitHub git repositories via developer panel of a Jira issue. The user PAT for "Require User PAT" setting should have Write permission. Otherwise, the user will not be able to use it for branch or pull request creation/deletion. For more information on organization teams, see GitHub: Organizing Members into Teams. For more information on inviting collaborators, see Inviting Collaborators to a Personal/Organization Repository. 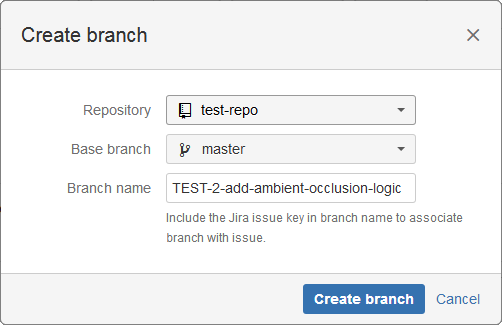 The Git Integration for Jira add-on automatically configures web linking for GitHub Enterprise repositories. This process requires a GitHub Enterprise git repository and a PAT with repo scopes. The service user must have Write permissions and the repo PAT scopes. If there are several repositories with the same name, the listed GitHub repositories will have their names attached with a GitHub organization name. For example, BigBrassBand/second-webhook-test-repo. 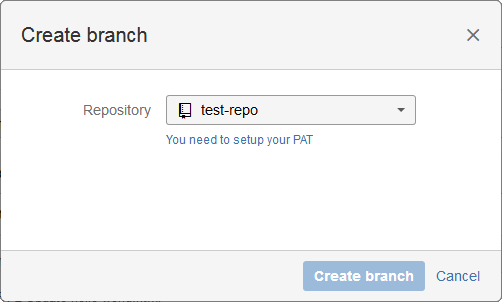 Click the icon to setup a valid PAT for the selected repository. Paste a valid PAT of the current user to proceed. Invalid PATs will fail the branch creation process. On the developer panel under Git Source Code, click Create Pull Request. 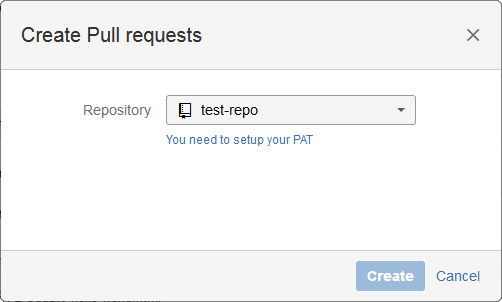 If an invalid PAT was configured for the selected repository, the pull request creation process will fail. 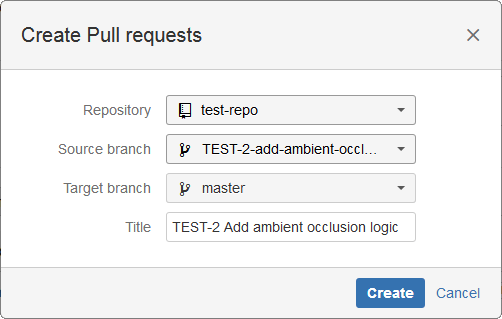 The pull request is also ready for approval by the reviewers in your GitHub Enterprise web portal.